Have you ever listened to an Audiobook? If not you should give it a try. As many of you know I work part-time at our local hospital. Local to me means a 20 mile trip to and from. I live right smack in the middle of no where. I listened to The Publicist when I was driving. The minute I got into my Jeep to and from work I turned on the Publicist. I found myself looking forward to the ride to find out what was going on with Kate. I loved the book ~ I was immediately drawn into the book. The Publicist took me into the life of Kate, MacDermott, Allan, and Nick. I understood why they reacted the way they did. Christina George was excellent at expressing the emotions of each person addressing their wants, needs and desires. Understanding the publishing business was very interesting and at times extremely stressful for all involved. I can hardly wait to read/listen to BOOK TWO ~ Shelf Life!!!! Lisa Cordileone - The narrator of the book was excellent. She was a very good story teller. Her voice was easy to understand. As a child I loved being read to and this was no different. I really really enjoyed being told the story. Great News ~ I found out that Shelf Life (Book 2) will be released on audio book in February. Lisa will also be narrating Shelf Life. I am really looking forward to hearing what happens next! Audible is AMAZON's Audiobook site. It is super easy to download a book. I personally listen to The Publicist on my Windows Smart Phone. I downloaded the Audible app - pinned it to my main page. I went to The Publicist book site on Audible - ordered the book - downloaded it and immediately started listening. EASY!!!! What is really nice is that Audible has a great monthly membership plan which I have joined. Choose one great book a month. As someone who self publishes I am always interested in reading books about the publishing world. Often, fiction is very close to the truth! Sounds like a good read. This sounds facinating. I will put it on my list for sure. How awesome! This looks great I will have to check it out! This sounds like a great read. Maybe I'll pick it up once I'm done with the two books I'm currently reading. 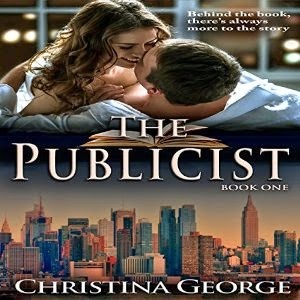 I was a publicist for many years so I would definitely love to read this! As both a reader and a writer, this book sounds like a great read! "book one" means that this is a series! Can not wait to dive in :) This sounds amazing! This sounds like a good one! I am in between books (again) so I need to check this out. Sounds like a good book I would enjoy. I will put this on my list! I actually used audible before and it was so convient for me when I was flying to Cali this year! I went to school for PR so this book sounds like a great one for me to look into! I love audio books, and I have a 25 minute commute (to and from work) each day. This sounds like it would be great for my work week! I love to read and this sounds like a good one. I really enjoy audio books as well especially on my way to work. The Publicist sounds so intriguing. What a great review! I have several friends and relatives who enjoy listening to audio books while driving and/or riding. I have never tried an audiobook, but now I am intrigued! It would probably save me a lot of time if I went that route. This sounds like a real fun read too! This might be good for the long road trip I have up north this year. I'm interested! I used to want to be a publicist so I'm sold just by the title. Sounds like a cool read. When I was working, I got into audio books. Sure did beat listening to radio with all those commercials. This book sounds pretty interesting. I thought I commented, but it looks like it didn't take? Luckily I visited again today, lol. I think audio books are great when you're cleaning the house! Makes time fly right by! I have not really listened to audiobooks much. This sounds like a good one. Thank you so much for the review and the comments on your post are amazing. I adore audio books. I was so worried about the narrator you know, getting "Kate" just right but Lisa did a fantastic job. I appreciate the support so much, thank you again! This sounds like such an interesting book -- and I love the tip about listening to audio books. I do that on long car rides to and from my parents home (they live six hours away!) and it makes the drive a breeze.